With a 5 day northeaster likely blowing away the last of our white marlin fishing this past week, I am starting to think about MEXICO......and you need to as well if you are thinking about Isla Mujeres sailfishing this winter as lodgings are filling up!! 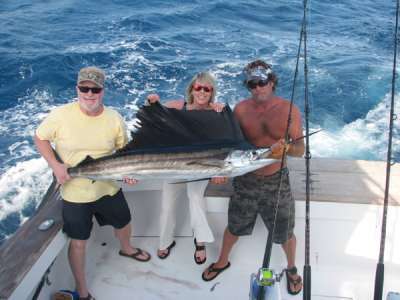 This will be the 12th season that I will be bringing the OBSESSION to Isla Mujeres, and my 15th sailfish season in Mexico. 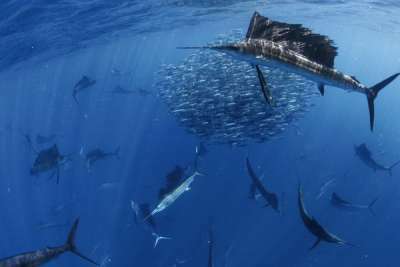 The waters off the northern Yucatan Peninsula hold the world's greatest seasonal concentration of Atlantic sailfish, and provide some incredible light tackle billfishing. Typically, fishing from January thru mid March is outstanding....The last two years have not been as good as most years, but we still averaged better than 12 fish/day and had several 40+ fish days..... even a slow day in Mexico is often an outstanding day anywhere else. 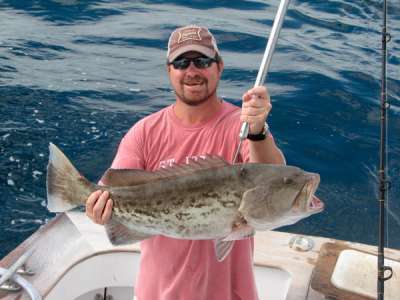 This year, in addition to sailfishing, I will be bringing a live well so if the live bait is available and conditions are good we can do a little live bait fishing for grouper and snapper, and if we are fortunate to catch a few, I will turn you on to a world class fresh fish meal dockside at the legendary Ballyhoo Bar and Grill or possibly Morgan's in downtown Isla Mujeres. 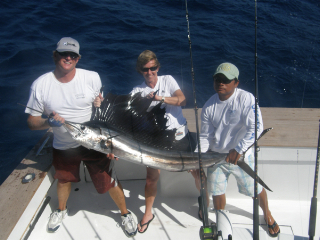 As many folks who have fished with us over the years have figured out, Isla Mujeres is not only about the fishing. Four of the groups that have already booked multiple days with me this year, have fished with me for three to ten or more years down there..... they stay for one to two weeks, fishing a few days and enjoying the islands wonderful weather, great food, lively night life and just overall positive energy. Better than 70% of the folks that fished with me last year or are scheduled already this year, have fished with me down there in previous years as well. Its a great place and everyone looks forward to returning. A cold front occasionally makes it down there and temperatures may drop into the low-mid 70's, though most days the daytime temperatures average around 80-82 degrees with low humidity. Perfect! Whereas along the border and other areas of Mexico, cartels have been a problem, on the remote island of Isla Mujeres, there has never been a problem with the cartels or for that matter any major crime. 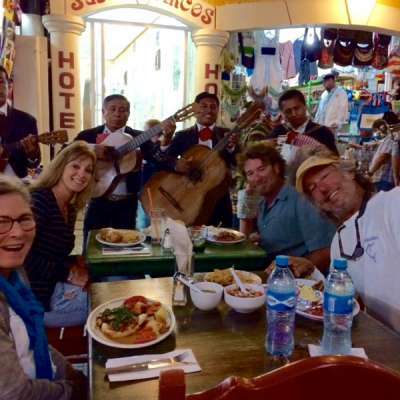 The local populace is extremely friendly, and the island's growth has included many expatriated Americans, Canadians & Europeans who have moved to Isla Mujeres and opened up a diverse and eclectic mix of excellent restaurants, boutiques & galleries. My wife has traveled to the island for the last 15 years and navigates its streets night and day with no worries! The cost of chartering the OBSESSION in will be $2200/day, the same as last year. A $1000/day deposit will be needed to secure your fishing dates. If you prefer, as many did last year, you can pay the full amount ahead of time and not have to deal with it in Mexico. The deposit or full payment can be sent to:: Captain Jeff Ross 3102 S. Ocean View Ct. Nags Head, NC 27959. The OBSESSION provides all bait and tackle. We use Shimano TLD 20's with 25 lb line on light action stand-up trolling rods. We encourage angler participation and enthusiastically work with everyone interested in hooking their own fish. We use exclusively circle hooks to reduce injury to the sailfish. 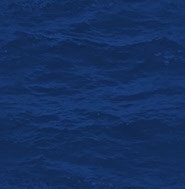 We will leave the dock at 6:30 AM and return around sunset (6 PM). We provide lunch, including sandwiches, munchies, fruit, yogurt, and drinks including a case each of water, soda and cervezas! All you need bring is polarized sunglasses, sunscreen, rubber soled shoes, hat, camera, and good luck! The OBSESSION will again be docked at Enrique's Marina, on the island of Isla Mujeres. 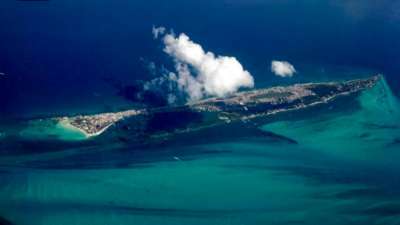 To get there, you fly into Cancun International Airport. From Cancun airport, you take a half hour cab ride (should be no more than $50) to Puerto Juarez, the port where you take the new (fast) ferry to ISLA MUJERES (tell cab driver want to go to "Puerto Juarez.... new ferry to Isla Mujeres"). The ferry ride is 25 minutes, costs less than $10 and runs every half hour (6AM-11PM). The ferry lets you off a stones throw from my boat. Grab a cab or hire a bicycle cart (always at ferry dock) to drop your stuff off at your hotel and if staying on the North end you can walk everywhere from there on....to boat, town, restaurants, beaches, ferry, everything within 5-10 minutes. DO NOT WAIT TO LONG TO BOOK YOUR HOTEL RESERVATIONS! Hotel Playa Media Luna Beautiful ocean views, first class, small and private, very peaceful; impress your lady (this is mine and my wife's most favorite). Nice for couples. I would be happy to provide more details upon request by email or phone (evenings: 252-480-0094). 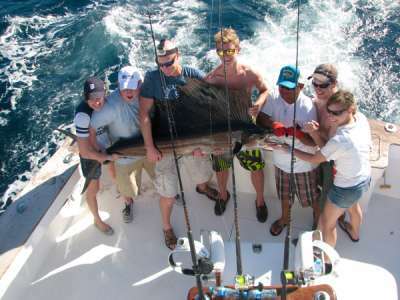 Check out the fishing reports section of my website for pictures of fishing in Mexico this past season. Captain Jeff Ross grew up fishing New England waters, working on 85 ft headboats for big bluefish and school bluefin tuna, and private sportfishing boats for giant bluefin tuna, sharks and marlin. He received a B.A. degree in Zoology at Ohio Wesleyan University (1974) and a M.A. degree in Fisheries Biology from the College of William & Mary (1979). 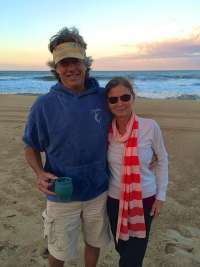 Since moving to the Outer Banks in 1982, and during the time he was a fisheries biologist for the NC Division of Marine Fisheries, Captain Jeff worked as a freelance mate on charter boats fishing out of Oregon Inlet. Since 1994 he has owned and operated his own charter boat, first the 48 ft Ocean OBSESSION and currently the 55ft Sheldon Midgette built OBSESSION.